Promix Solutions, leading supplier of Static Mixers, Foam Extrusion Lines and Melt Coolers will be presenting several highlights at the upcoming K show dedicated to the slogan "Mixing, Foaming, Cooling". One of the company's recent developments includes key components for the production of low density foams such as for XPS, XPE, XPP or XPET. The equipment consists of the unique cooling mixer technology P1, plus a novel annular die named Q1. For the production of medium to high density foams the company offers unique foam extrusion systems including high-precision gas dosing units. Promix Gas Dosing Systems work with inexpensive and eco-friendly blowing agents: CO2 and N2. Furthermore, the static mixer portfolio for the homogenization of polymer melt in extrusion or injection molding will be complemented by a new inline viscometer called "Visco-P". Promix Solutions AG, a “spin-off” of Sulzer, stands for mixing, foaming and cooling in plastics processing and polymer production. The company serves the industry with effective solutions for cost savings and quality improvements in extrusion and injection molding. A motivated team with long standing experience and extensive process and application know-how ensures excellent consultancy and service. The portfolio consists of mixing nozzles, melt blenders, foam extrusion systems, CO2/N2 Gas Dosing Stations, Key components for the production of low density foams and melt coolers. Mixing nozzles and static mixers for injection molding - Improve your process now! You can solve many of your today problems in a fast and cost effective way without interrupting your production. Find the hidden potentials to further process optimizations. Save master batch costs of up to 30 % or reduce the cycle time. The Static Mixer is installed directly in the nozzle of the injection molding machine. You can rely on an experienced partner replacing your existing nozzle with the suitable complete Mixing nozzle from our extensive mixing nozzle portfolio. Most of the mixing nozzles can be delivered within 1 to 2 weeks. Do you wish to optimize your extrusion process? Promix offers you effective static mixer and melt blender solutions including extrusion housings at low investment cost. 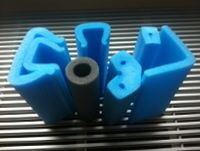 Promix foam extrusion is a unique, licence free technical concept for foam extrusion. Promix foam extrusion allows to cut production cost of semi-finished products due to reduced raw material consumption. It is also used to substitute chemical foaming additives with eco-friendly blowing agents as CO2 or Nitrogen. Promix foam extrusion systems are in industrial use for many different applications and products. Mono- and multilayer foam lines are in operation with capacities of 5 kg/h up to 2000 kg/h producing superior foam products including microcellular foams. Here below are a few examples. Promix Gas Dosing Stations for physical foaming have been developed to suit the specific needs of foam extrusion applications. Extremly high dosing accuracy, reliability and easy operation are the key features of Promix gas dosing systems. No matter if process monitoring with trend charts and user settable alarms, data acquisition, flow match with extruder output and many more, Promix gas dosing units provide all the required features for state of the art foam production. Furthermore, implementation in extruder control via fieldbus system is also possible. Do you wish to cool down your polymer melt? Promix offers you very efficient melt coolers and heat exchangers for viscous and high viscous fluids and melts. In cooling processes viscous fluids tend to deposit at the cooling wall sections (fouling) leading to reduced cooling efficiency. In the Promix Melt Cooler (PMC) the melt flows in a single stream through the cooler. The cooling media flows in special pipe bundles arranged similar to those of the Promix mixing elements. The intense mixing together with the very high heat exchange surface area leads to effective cooling with very limited risk of fouling. Due to a void volume of about 75 % the resulting pressure drop in a PMC is rather low. The PMC can as well be used for gentle heating with only small temperature difference between heating media and fluid. Fill in the PMC inquiry in order to get an offer or contact our experts for further questions. 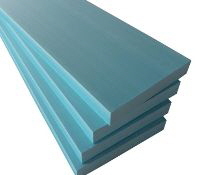 Promix offers relevant key components to optimize production of low density foams as for example fabrication of XPS insulation boards, XPE foam film or XPP, EPE thermoforming sheet. Implementing Promix key equipment generally results in lower foam densities, improved cell structure and an increased line output, leading altogether to significantly lower production cost. Whether it is a tandem or long single screw line, thermal insulation boards, packaging film or insulation for tubes or pipes: we will analyse your current line concept and are going to propose a solution to increase your profitability. Visit us at the K show 2016. We are looking forward to welcoming you on our stand (hall 9, stand E32).